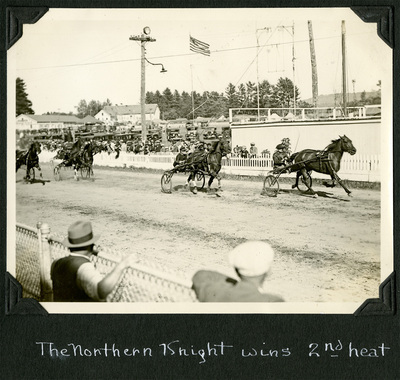 Sepia tone finish line photo of the second heat of the 2.14 Trot and Pace at the Oxford County Fair, South Paris, Maine, 1933. According to Guy Kendall's notes on the race score card, the top three finishers are, left to right, Ben McKylo, Napoleon Hal, and Northern Night. Northern Night was the leader in the race until being disqualified in a run off.